In an effort to help you navigate the congested app landscape we have collected our favorite news concerning the iPhone, iPad and iOS so you can get the most out of your mobile creation moments. This month Moog Music impresses us with a new synthesizer application, Korg ports their infamous Kasossilator to the iOS platform, SoundCloud updates their app for the iPad market, NodeBeat offers a clever new approach to creation, and GarageBand comes to the iPhone with new updates. In addition, Moog has released a free set of “unsettling and bone-chilling’ sounds” for the Amimoog as a promotion for the Halloween season. “The add-on to Animoog includes presets that span the range from sci-fi to horror, and, in some cases, look like their names. Users can watch for the Zombie Hand, run from the Cyclops, escape the Evil Portal, and avoid the Scythe of the Grim Reaper.” Head over to Moog Music’s website and provide your email address to get this free download. Never too far behind on anything iOS related, Korg has also released a new synth app for the iOS platform – the iKaossilator. It was only a matter of time before the company ported the ever popular Kaossilator synth into the (quite appropriate) iOS format. The Kaossilator became widely popular for its intuitive X-Y Touchpad that provides expressive musical control for the synth. This interface appears in Korg’s iMS-20 application but the iKaossilator provides a much simpler and therefore user friendly experience for synthesis. iKaossilator uses the same X-Y interface made famous by Korg’s Kaoss Line and comes with 150 built-in sounds for a broad range of dance music styles. The built-in loop sequencer lets you layer up to five musical parts. To create a track, assign a loop such as synth, bass, chords, sound effects, or drums to each part. In addition to its track-making capabilities, this loop sequencer is designed for live performance. The Mix Play feature makes it easy to switch seamlessly to another loop or extract a specific part from another loop while the playback continues. If you haven’t tried the original hardware synth (which sells for approximately $120) you can get your hands on a faithful re-creation of the experience for an introductory price of $9.99. 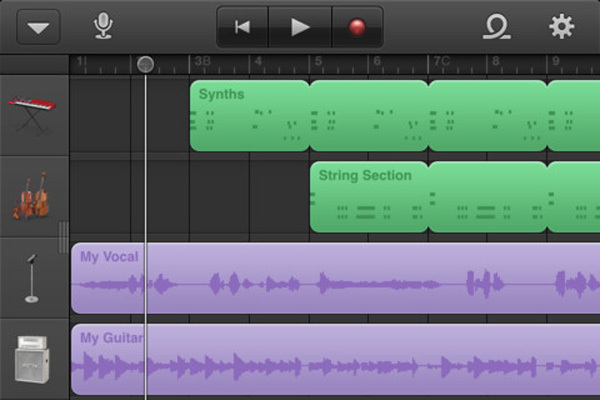 Apple’s GarageBand often gets overlooked in these roundups but it really shouldn’t. The application is easy to use, stable, fun and useful. While it’s been available for the iPad for some time now, Apple recently released GarageBand for iPhone and iPod touch users. As expected, the interface is well-designed and the app is worth checking out for the $4.99 price tag. In addition, here are some new features in GarageBand 1.1 for iOS: Create custom chords for Smart Instruments, support for 3/4 and 6/8 time signatures, reset song key without transposing original recordings, transpose songs in semitones or full octaves, additional quantization options, new audio export quality settings for AAC and AIFF, prpeggiator available in Smart Keyboard, adjustable velocity settings, and improved audio import options. “GarageBand on iPad has been a big hit and we think customers will love using it on their iPhone or iPod touch,” said Philip Schiller, Apple’s senior vice president of Worldwide Product Marketing. Thanks! And yes – the Apple “iOS” is pretty spectacular. I was also stubborn about getting an iphone.. (I was rocking a blackberry up until recently – I like the keys) but I had to pick up an iPhone due to the sick music apps that are available.